The Philippines is one of the world’s many gifts. It is an archipelago that consists of more than 7000 islands, and just to get a clearer image of the length of its coastlines, it would take you 20 years to spend a single day on every beach. Wildlife and flora are abundant in the Philippines, and some endangered species call it home. As you can imagine, with so many islands, there are many fantastic scuba diving and snorkeling spots. The Tubbataha Reef’s National Park is one of the most fascinating places to observe marine life and dive through the colorful coral reefs. Other than that, do not forget to swim in the blue waters of Boracay and El Nido. But before you take your trip to the Philippines, you need to see if you need a visa to enter the country. Lucky for you the visa policy of the Philippines is pretty lenient, and you may need one. 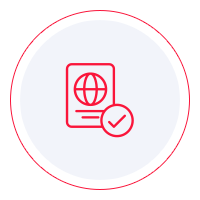 In fact, many nationalities around the world can enter the country visa-free, but the stay durations differ depending on the nationality. They vary from 14 days to 59 days. At the same time, visas on arrival are also available for eligible nationalities. One thing that is worth mentioning is that all visa-exempt national can extend their stay with two months per extension, but the entire stay duration cannot exceed two years. Nationals who must apply for a tourist visa can also extend their stay, but only by 30 days per extension, and the total amount of time spent in the Philippines cannot exceed 6 months. The latter category also needs a return or onward flight ticket. If you want to learn in which category you are, the most convenient solution is iVisa’s Visa Checker. Click on the Visa Checker button located in the top-right corner, select your country of origin in the menu on the left, and choose the Philippines in the menu on the right. The result will display whether or not you need a visa, and if you do, you will get a list of the nearest embassies where you can apply. The next thing you want to do is read about the Philippines visa requirements. That is if you need one. The internet is full of such information, but we recommend that you do not fully trust it, and use it as a reference only. The information you find online is not always the most reliable. That is why our suggestion is to call the embassy or the diplomatic mission and ask them about the requirements. That way, you get the info you need from a reliable source. In the meantime, what we can tell you is that all travelers who plan a trip to the Philippines need a valid passport that remains as such for at least another 6 months from the date of arrival. We regret that iVisa cannot process visa applications for the Philippines at the moment, but should that change, we will let you know. In the meantime, we hope that you find the information above useful. For more information, you can contact our support service. It is available 24/7 and free of charge.